I’ve worked with a lot of plants this week. On Sunday, the sun shone bright and the temperature was in the 70’s. More importantly, we had our most successful Master Gardener plant sale ever. With a committee of 12 and a volunteer group of 27, we set up tables, signs and tents and handled over 700 plants during a seven-hour period. It was a lot of hard work, but the proceeds will fund our community projects and our UNH Thomas School of Applied Science scholarship. 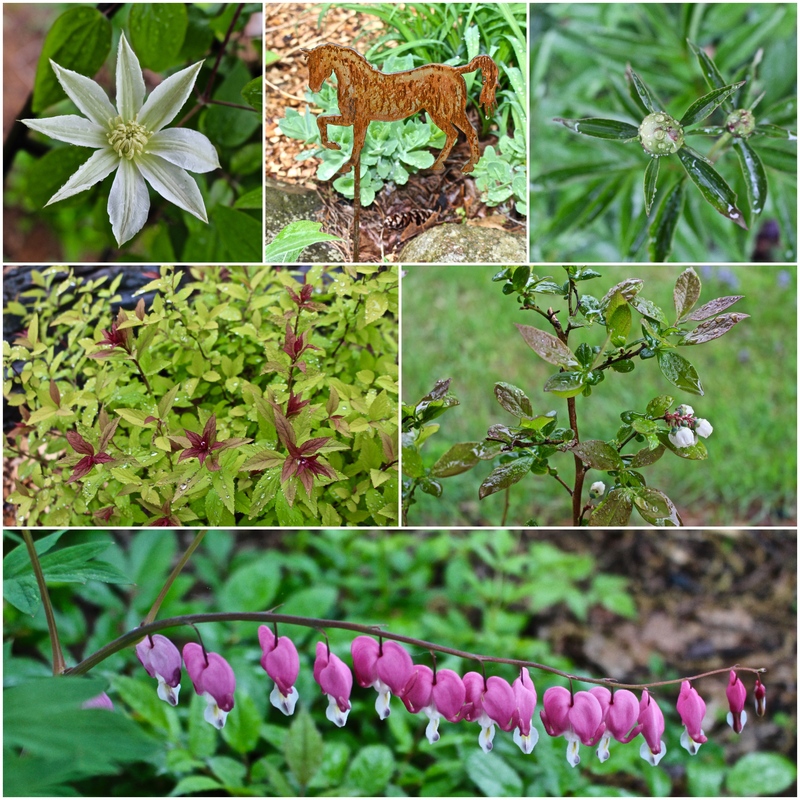 The Clematis and Bleeding Hearts are blooming while the Peonies and Blueberries, are budding, and the Spirea is changing colors. I love horses. We owned full size and minis when we lived in the Midwest so I really like this new little piece of garden art. Under these circumstances, the weeds are also growing like they are on steroids. Besides plain ordinary weeds, I’ve been picking buckets full of sprouting oak and maple seeds from all of the beds. I have always wanted a small water feature in the garden, but we do not have electrical access to the beds. So, last week I bought a new bird bath and added a solar bubbler to it. I love it, and for $17 a little water feature with several different heads is a fun addition. Plus, it will be easy to pick up put away for the winter. It is an Ankway solar bird bath fountain pump. I ran across it by accident, but after reading the reviews it seemed like a good choice. It only works when the sun is shining on it, but that’s usually when I’m outside enjoying the gardens. It might not work for everyone, but it is fine for my needs. 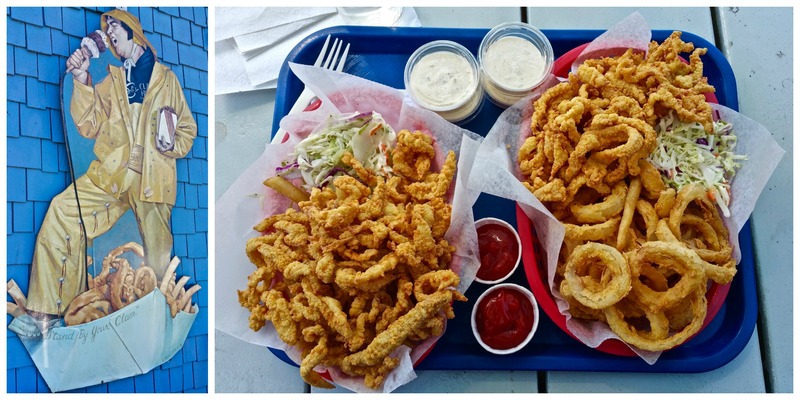 With the coming Memorial Day weekend, that is our clue to head to Bob’s Clam Hut for a lunch of fried clams. We do that every year before tourist season starts and then don’t normally go back until after Labor Day. Already, they had people directing traffic and a waiting list for tables. The license plates in the parking lot looked like a tour of the eastern map. This entry was posted in Gardening, New England and tagged Ankway, Anyway solar bird bath fountain pump, Bleeding hearts, Blueberries, Bob's Clam Hut, Bottle Tree, Clematis, Dwarf Korean Lilac, Ladys Mantle, Life in New England, New England, New Hampshire, Patriot Hosta, Peony, Solomon's Seal, Spirea, Summer, Tourists. Bookmark the permalink. Pretty pics,Judy. The bubbler looks like a good idea. I like your approach to the summer season, get in before it starts and after they’re gone. Congrats on the successful sale. 700 plants, is a lot to transport and move around. You guys did a good job. Most of our tourists are either on the shore or on their way to you guys. North Central CT isn’t much of a destination. But, I-84 and I-95 don’t have tolls, so people prefer them to the Mass Pike. Depending on the time of day, I’ll go up to Springfield and jump on the Pike. The toll to Sturbridge is minor but the traffic will be lighter than 84. Yes, congrats on your successful plant. Your photos are beautiful. Love the idea of the solar pump in the bird bath. We might borrow that idea. As for Bob’s Clam Hut…Best. Clams. Ever. I like that solar pump idea, as well! All of that, Judy – We are in the country, but on a busy road, and the sound of water would help mask the sound of cars. PLUS – is would be cute AND keep the water fresher for the birds – so – it’s a real solution to many issues. I appreciate the recommendation. Sounds like a wonderful plant sale, Judy. I’m in awe of your dedication to the bottle tree by emptying on for the team! You rock. 🙂 Lovely photos and those clam strips sound delicious. I’ve always said you live in a wonderfully charming part of the country (lighthouses, clam shacks, maple syrup, colonial era buildings, knock-em-dead autumn foliage) but I think your garden plot is the best place to be of them all! Your photos look like a page from an upscale gardening catalog. Everything looks so happy and well fed! I have a bird bath too (no bubbler, tho) and love seeing little critters flit about at their morning ritual. Have you installed your new bird house yet? 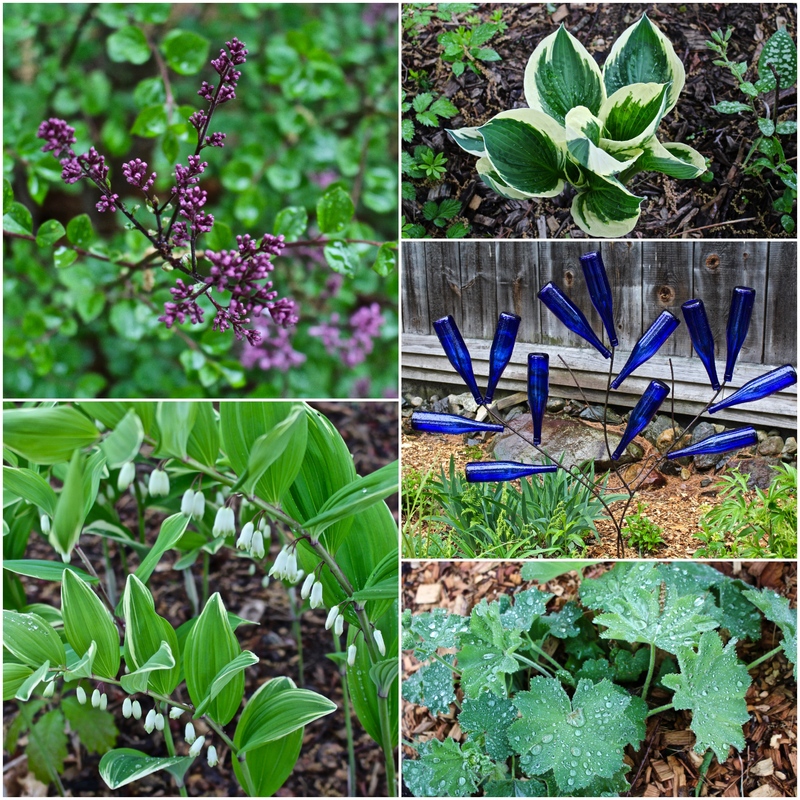 I love how your garden has unique treasures accenting here and there – sweet little surprises tucked in unexpected places – all so tasteful! Such beautiful plants! Congrats on the successful MG sale! Your blue bottle tree is cute. Thanks for the info and link to your solar bubbler. 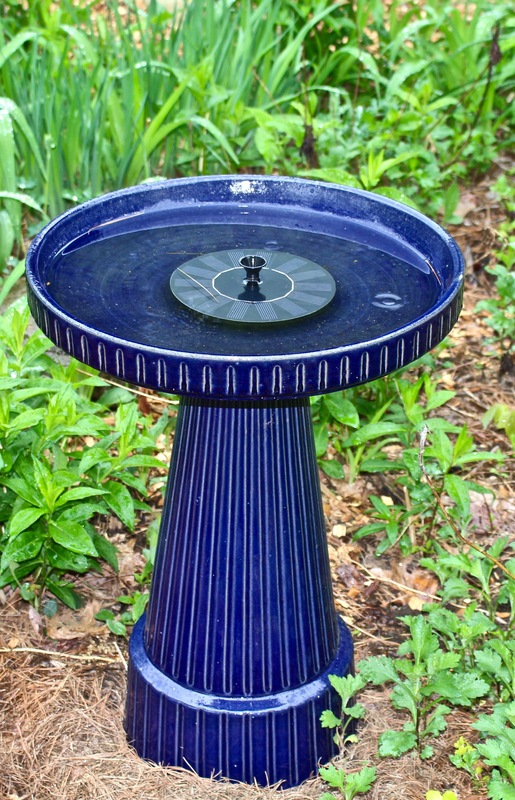 I have a bird bath in the backyard that isn’t connected to electricity as well and I’ve always wanted to circulate the water in it. I’m going to look into that unit. I’ll be in the yard getting it “cute” for summer this week, and we bought a new gas grill I need to make room for since it’s larger than our little Weber. It would be lovely listening to water bubbling while out in the yard. Job well done on your MG plant sale. Congratulations on its success. You gotta smile when you see the bottle tree. Love it! You probably did a lot of smiling emptying all those bottles!! 😂😂 I’ve never been a fan of hostas, but I really like the patriot hosta. All your plants look picture perfect. I have two bird baths. One in the front garden and one in the back garden. Add in hummingbird feeders and they’re better than watching TV. That solar pump has peaked my interest. Your new bird bath is a beauty. Enjoy the coming holiday weekend. Glad you made it to the clam shack before the multitudes descended! All so pretty with the rain drops!!! This is such an exciting time of year as everything starts to grow like crazy. Most of our plants are a bit behind compared to your’s, except for the hostas and the blueberries. After last year’s banner crop of one blueberry, I’m thrilled to see my two bushes full of flowers this year! Here’s hoping your exceed last years crop. 🙂 For the first time ever, the birds ate every one of mine last year. So, we are discussing how to thwart their efforts this year. Oh Judy, how beautiful. I love your bottle tree and I’m impressed with the effort you made to collect and empty all the bottles. 🙂 I wish it was possible to tell the weeds they aren’t welcome. It would make life so much easier. It’s so inconsiderate of them not to listen. Mmm, those fried clams look delicious. What I remember from growing up in NY was little clams that were sold as “steamers”. Your cobalt blue bottle tree is rather fetching, as is your matching birdbath. The sound of water adds so much to a garden and it will attract more birds, too. Yikes, I can’t believe it’s almost Memorial Day already! Isn’t spring wonderful? Love your blooms and I think you’re a little ahead of me now. My blueberries aren’t in bloom, nor is my clematis. Congratulations on your plant sale. Our garden club has one but they sell to each other in an auction setting. Go figure! That is a whole new take on a plant sale. Very interesting. I’ll be those containers of plants are pretty special. It’s lively and fun but our MG sale in Virginia had the best of the best… just like your sale. Congratulations on such a successful plant sale, everything looks healthy & thriving … & the bottle tree is a great memory of South Carolina! I love the solar bubbler … That would work all day in our summer. So we got the A/C in and the temps went down into the 30s. And the rain came back. What kind of May is this? I should look into a solar bubbler! Or like, four. Thanks so much. Love the hostas. Hostas are so highly underrated. And bleeding hearts. I had those before, but not here. I will add some. One day. That’s not just a garden; that’s a GARDEN! How gorgeous everything looks. The garden jewelry is so much more fun with a story. Thanks for the word about the solar-powered fountain, and congratulations on the plant sale! Oh, and kudos to you for your noble determination to empty those bottled! Love that bottle bush, Judy. What fun, both in the making and the delight it brings to your garden! Sounds like a banger of a plant sale…wow!! Are most the plants donated by community members or businesses as well? We contribute to quite a few in our area but I’ve never heard of them doing the volume you folks have! Applaud, applaud!! 99% of the plants come from the gardens of the Master Gardeners. On the day of the sale, the UNH Greenhouse donates some annuals as classes are over for the summer. The amount and variety of the annuals vary from year to year. This year they were geraniums and petunias that sold quickly. It is a huge undertaking, and I was toast that evening. But, we sure did have a great sale. I, sadly missed the Master Gardener plant sale last weekend 😔 Although I can get my plants wholesale from nurseries, you just can’t find some of the plants offered at the MG sales. There are some rare ones! Wow – lovely post. Your plants are stunning & I love how the birdbath matches your bottle tree. Congrats on your sale! Ha ha Judy, I the same, wearing a coat this spring. Love your blue bottle, sure you liked wine 🙂 Of course there is a lot of work in the garden, weeds grow as mad, I don’t care too. Love your water feature, especially it does not need power. I am really impressed that you all managed to pull off such a massive plant sale. I imagine it was exhausting. Your plants look to be thriving. Our blueberries and haskaps have been loaded with blossoms this spring. Weren’t you looking for haskaps (honeyberries) last year? Did you find and plant some? We had no berries on our first year plants last season, so I’m looking forward to tasting them. Thanks for the recommendation of that solar birdbath bubbler. It’s already in my shopping cart. The tourists got a head start on Memorial Day this year in our stretch of Maine. I was shopping in Rockland yesterday and the parking lot was well-larded with pricey SUVs and convertibles with out-of-state plates (including Virginia, South Carolina, and Georgia). I moved a large high bush blueberry last year, too, and it is struggling. Judy congrats on the success of your sale! You ladies work so hard on that and all of your projects. So much going on in your garden and I had a laugh at the bottles! 🙂 All for a good cause! I was really enjoying your plants and even your solar bubbler Judy, and then I had to laugh out loud at your clam shack! Know just what you mean. Our little island grows exponentially during the summer, hard for the residents to understand because we’re all leaving LOL. I guess the ocean breezes beat the inland weather even in South Carolina! Your plants are looking beautiful. I was struck by the sharp contrast on the hosta leaves! A bird bath is something lacking in my yard, but I just can’t seem to find one that I like (without needing to mortgage my house to buy it). The bubbler is a nice addition that I could go for. Might be silly without the bird bath, though!! The bubbler would also be handy to keep down the mosquito population, where we live! Beautiful photos of your garden, Judy. I love the idea of the solar bubbler – thanks for sharing that.